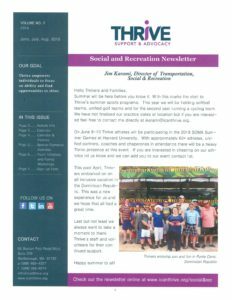 If you want to know what’s happening at Thrive, the Social & Recreation Newsletter is a must read. With over twenty experiences monthly, for both youth and adults, there is something for everyone. From sporting events to social outings to caregiver workshops, this quarterly newsletter is the go-to for anyone who wants to try new experiences, meet friends, and create well-lived moments.